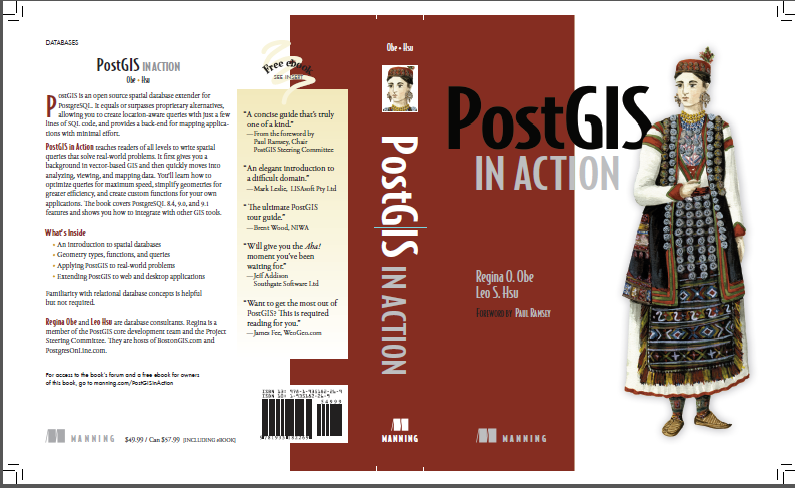 We just got our complimentary author hard-copies of PostGIS in Action today. Those who ordered directly from Manning should be getting there's shortly too if they haven't already. Amazon and other distributors should start shipping soon as well. We'll be saving some copies for door prizes at the next event we present at. The postgis_comments.sql file file that installs database psql/pgAdmin online help online help is not listed. The postgis installed docs are located in /usr/share/doc/postgis90-1.5.2, but I couldn't find the postgis_comments.sql file. If you want that, it's located in the docs folder of the official PostGIS 1.5.2 source tar ball and you install it after you have installed postgis.sql. To create a spatial database or spatially enable a non-spatial database we do this: Note for the GRANT - if you are not paranoid about security, you could set that to ALL. For geography_columns there isn't any reason to give update rights since its a view into the system tables. Thought you would never ask. Well we've been playing with it on Windows, but have yet to compile and install on Linux. We will be doing that in the next week or so and write up a how to on that. 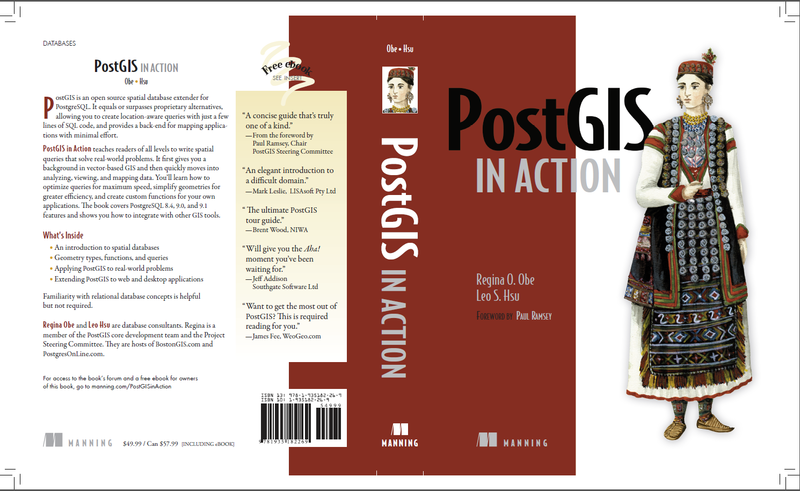 I will say that the new features in PostGIS 2.0 are to put it lightly, mind blowing. We've got true 3D surfaces, topology, lots more processing functions, raster with mapalgebra and even export to JPEG etc which looks like it will make it into PostGIS 2.0. We have tiger geocoder with both geocoder and reverse gecoder functions to work with Tiger 2010 census. We have to cleanup the tiger loader for Linux a bit more and will do that before PostGIS 2.0 release. We've got X3D output and GML for surfaces to target CityGML needs. We have the whole world in our hands. I would say we've got a good 2 more months before we will be ready to release. The results suggest that what I thought was the case as described in Output parameters, custom data type gotchas may not always be the case or at least not for SQL written functions. More analysis is called for. Also notice how the speeds flips between 8.4 and 9.0 (or at least on Windows), where calling the (). * was worse in 8.4 and in 9.0 actually faster than the FROM syntax. This is something I'll need to investigate with plpgsql functions with real tests and on Linux platform as well to make sure its not abberations in my development environment or idiosyncracies of the test example. I would be interested in knowing the explanations of others regarding what we consider a bit surprising of results and under what conditions this manifests.